If there is a thing out in the world that could potentially be made profitable, Goblins will be there. Even love. Especially love. 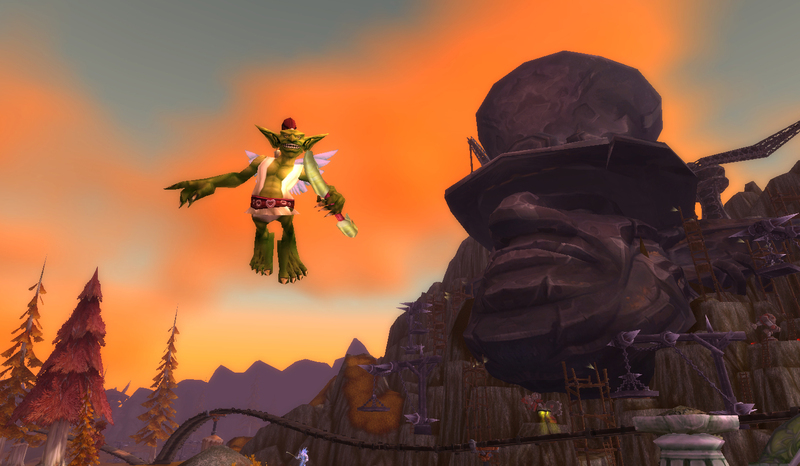 Goblins feature big in the WoW version of Valentine’s Day, the Love Is In The Air festival. 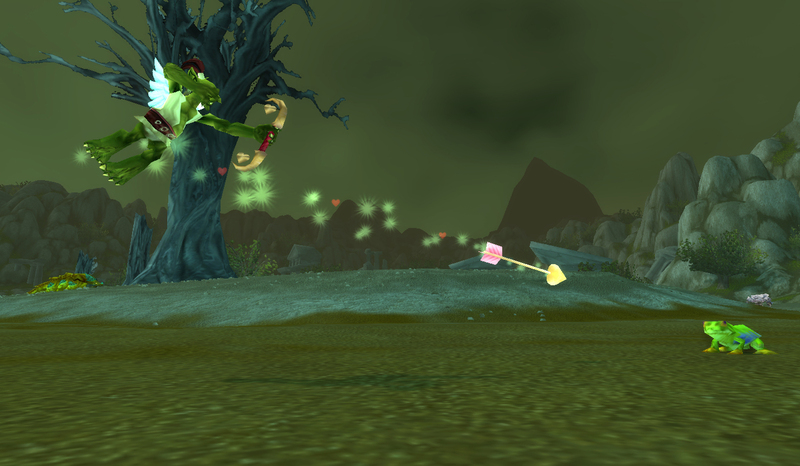 All the vendors are goblins, and the premiere battle pet of the season has always been the Goblinized version of Cupid. Instead of a mischievous little cherub, we get a tiny goblin with taped-on wings, shooting arrows souped up like only a Goblin can. He used to be extremely difficult to obtain, but now he’s available for a handful of holiday currency in every major city, Horde or Alliance. The 40 tokens you’ll need to trade with yet another Goblin to obtain the Truesilver Shafted Arrow come from a variety of places, but as long as you’re queuing up for the daily boss fight you will get enough by the end of the holiday to purchase one. If not, or if you’re busy with the IRL holiday (you dog you) Peddlefeet is cageable. He starts off as Uncommon so if you’re going the AH route it’s a good idea as always to aim for an upgraded one. Peddlefeet is a pretty premiere dragonkiller battle pet in PVE. All his moves are humanoid, though they do run the gamut. The only straightforward attack is Bow Shot in the first slot, though Rapid Fire is a fairly straightforward AoE option. He does have a lot of utility with the stun Lovestruck, and the slight chance for stun Perfumed Arrow. Also in his moveset is his Love Potion heal, which seems designed to be annoying in PVP, but gives him extra staying power too. He is quite suited to killing Yu’la in the Celestial Tournament, and a bit less so for ‘team’ pve dragonkin battle pets, where his stuns will earn you a swap. Humanoids in general are pretty vulnerable in PVP just now, with the prevalence of the undead Val’kyr/beast Death Adder Hatchling combo, but this guy’s final ability makes him even more so. Shot Through The Heart, though interesting, and one of the best lyrics ever, is a charged move for a big wallop, like Deep Breath. It’s really excellent for PVE, but not so much for PVP, where you’re sure to get stunned, blinded or otherwise annihilated in the intervening turn. In general he’s fun to play, but if you come up against any of a number of really common current teams it’s pretty much game over. Though he’s not a favorite, that last ability makes it all worthwhile, nostalgia-wise. Even though this song itself is about as Valentine-y as, well, a Goblin. This entry was posted in pet profile and tagged auctionable, holiday, humanoid, vendor on February 11, 2014 by Liopleurodon.